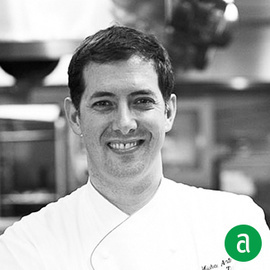 Michael Anthony, Executive Chef and Partner of Gramercy Tavern and Executive Chef and Managing Director of Untitled at the Whitney Museum of American Art in New York, shares his career timeline for up-and-coming professionals. There were a few chefs and stages that had a profound impact on my career: Michel Guerard at Le Pres d’Eugenie, Antoine Westermann at Buereheisel, Pascal Barbot at L’Astrance and Yoshihiro Takahashi at Hyotei. I learned early on in my career that it is important to choose the right tool for the job. Even on my toughest day, focusing on the thought that our staff and our guests only expect my best effort helps to keep me motivated. In order to keep the team inspired and motivated, we never miss the opportunity to congratulate our team on a job well done. Knowing that we share the ambition to improve our performance the next day is also motivating. Have confidence in developing what makes you as an individual, distinctive. I read, I travel, I cook, I eat, and I listen to everything around me in order to continue educating myself.